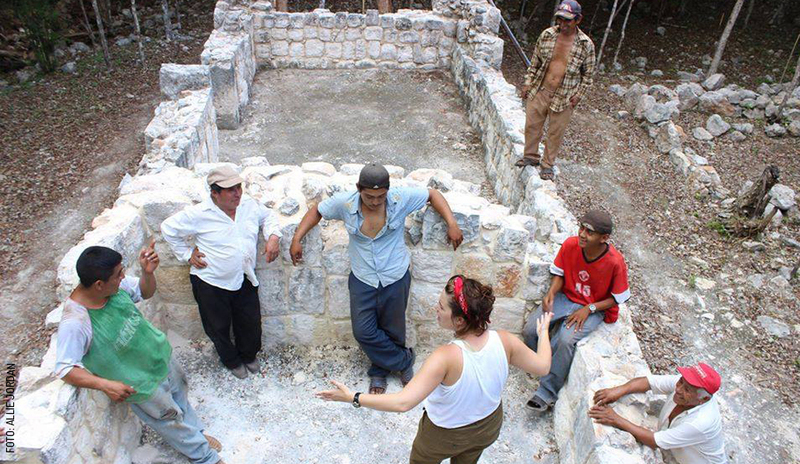 I flew to Yucatán from Mississippi for the first time in 2011 for an exhausting summer of archaeology. It was hot day after hot day of back-breaking (sometimes boring) work: measuring, drawing, and photographing artifacts. Labeling rocks by the thousands. The team and I dug through the floor of a three room stone home in Kaxil Kuic. We dug into the underworld. We found ritualistic offerings. Ceramic vessels — plates, pots — filled with remnants of food (a dirt dinner, by the time I got to them); special stones and lithic tools like hand axes; teeth, and other bones that were so badly disintegrated that they looked like small sheets of ripped paper. I learned that the bones would’ve been bundled together, the soul of the offering, and that the skull and long bones, like the femur, were the most important. When a family built a new house, they placed the bones of their ancestors in the offerings, blessing the home, and venerating the dead. My mind was alive with the reality of all that’s vanished in 1,000 years and with what remains. The baskets and bodies, food and firewood. We dismantled the offerings with extreme care, placing the artifacts in plastic bags with detailed labels. Some of the pieces would travel to labs for chemical studies, while most of them would spend the rest of their existence inside of plastic boxes, carefully placed in dark storage rooms, unearthed and sanitized. From the beginning, I felt conflicted. I returned to work as an archaeologist for five more field seasons, digging about 10 structures and probably 15 offerings, and in 2015, I reached capacity: I had unburied too many of the dead. I decided that I was more of an anthropologist than an archaeologist; more of a writer than a scientist. So I decided to live in Yucatán full-time, dedicating my studies to the living Maya, and, over time, doing that thing that all anthropologists dream of: going native. Now, I love in Spanish, and I spend most of my time with locals. Last year, when October rolled around, I prepared for Día de los Muertos like every other Yucatecan. Months before, I had lost two lifelong friends to the opioid crisis in the U.S., and death weighed heavily on me. I cried days on end, angry with it. My Yucatecan boyfriend and his family took me to the market in Hunucmá. We bought flowers, sweet breads and candies, candles, and “pib.” We carefully placed the articles on a wide altar in our living room, and we illuminated a path with candles, so that our dead could find their way. I placed a cigarette with a lighter for Matthew and a shot of tequila for Wes. I put out fruit roll-ups and brown sugar cinnamon Pop-Tarts. I burned copal for the ancient dead that I had unburied, and for the first time, I felt like I got it. I was creating exactly what I had undone time after time. I was living an ancient ritual.